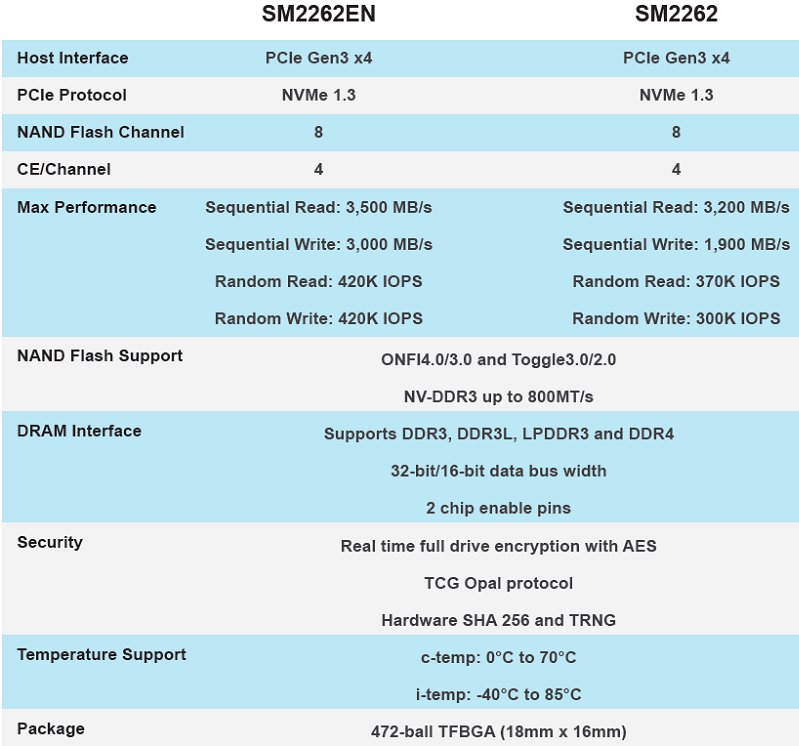 The Silicon Motion, Inc. (SMI) SM2262 Gen3 x4 NVMe 1.3 high-performance controller has had much success in 2018 thanks to having sequential Read/Write performance up to 3200/1900 MB/s and 4K Random performance is up to 370,000 IOPS! The affordable price of this 8-channel controller along with its solid performance has allowed a number of companies to go with this controller for their PCIe NVMe drives. Some of the drives on the market today using the SM2262 controller would be the Intel SSD 760p, ADATA SX8200/GAMMIX S11, HP EX920 and the Mushkin Pilot. 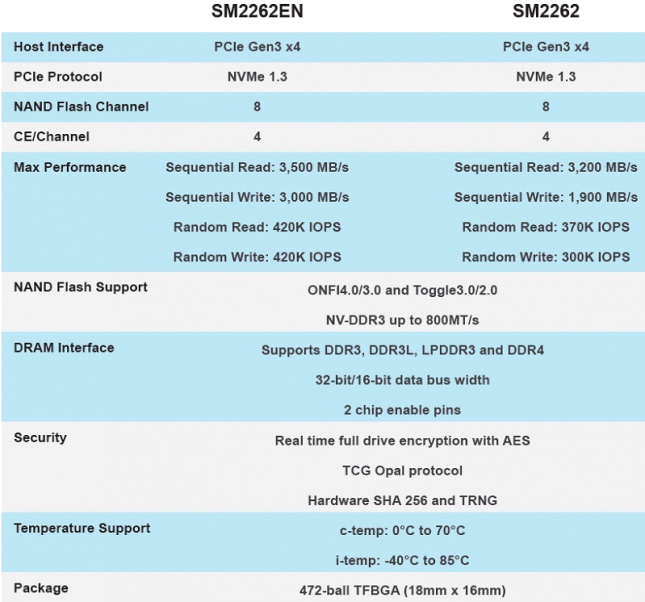 These drives all offer some of the best bang for the buck right now, but did you know SMI has an faster version of the SM2262 controller called the SM2262EN that is coming to market very soon? The SM2262EN controller is physically the same as the SM2262, but uses a different firmware build that greatly improves performance. With new programming and caching algorithms, the SM2262EN specifications have been bumped up to 3500/3000 MB/s for sequential read/write performance and up to 420k IPOPS for 4K Random performance. This is a modest 300 MB/s increase on sequential read speeds, but a massive 1,100 MB/s improvement on sequential write speeds. The 4K Random write performance is up 40% on the SM2262EN, so this drive really does take performance up a notch. SMI was able to provide Legit Reviews with an SM2262EN 2TB reference drive to try out. This is an early sample that uses Intel 64-layer 256Gb 3D TLC NAND Flash memory and 2GB of Micron DDR4-2400 CL16 DRAM. Most high-end SSDs have moved over to DDR4 for the increase bandwidth speeds to improve drive mapping table access performance. This is a double-sided M.2 2280 module and features four TLC NAND Flash packages to reach 2TB of storage space. Our test module still has the debug pins on it, so this is clearly an early sample and not a final retail product. SMI did not give any guidance when this drive will hit the market as it sounds like they are still perfecting the firmware. We can’t wait to see how the SM2262EN does against the Phison E12 SSD and, so let’s get to testing. SMI does not use a proprietary NVMe driver, so we’ll just pop the drive into our Intel Z370 test bed and use the NVMe driver that comes in Windows 10 for testing.